I am kind of sad to be posting this since it means that before we know it school will be back in session. For many of my friends who go to large state schools (specifically in the SEC) this is their last week of summer. They will soon be back on the road to begin preparing for the semester and for many, recruitment (that's a happy hint at tomorrow's post). While I still have a bit of time left before heading back my to do list will soon be filled with things that relate to gearing back up for college life. While I am completely excited to finalize some apartment projects and decor packing up is always a task that tends to be quite the undertaking. Having two years under my belt at school I am starting to get it down to a science but as an over packer by nature it can be so difficult to narrow things down come time to actually leave. I can guarantee you that I am adding odds and ends to my packing pile until the very end. To make life a bit easier for myself and all of you college bound cuties I have compiled my packing list to help us all out. While technically all of this is optional to bring I have tried to signify some of the things I brought that aren't necessary but helped make my room feel like home. 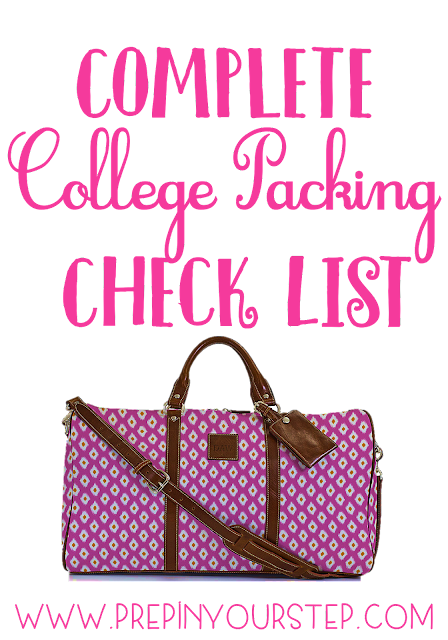 Think of it as your own personal packing list for all of the things you could possibly need and want to make your college dorm feel more like home! Take into account that these are my personal recommendations and that your list may vary to fit your personal needs. Regardless, I hope this helps you to remember some things that might be easily forgotten! I have tried to make this as complete as possible however if you see that something is missing then feel free to comment below what I have forgotten so that I can add it to the list! I also HIGHLY suggest that you communicate with your roommate in order to split up some of the higher priced dorm necessities! By communicating in advance you will hopefully not show up with an overlap of essentials and may even be able to coordinate your bedding if you'd like! Also, it is helpful to check out your universities housing page to find out what all is included in your room. For instance, Furman University provides a micro fridge in the dorm rooms and therefore it was not necessary for my roommate or myself to bring one! As for clothing (which I didn't include since that will vary based on your closet) I do recommend transitioning your wardrobe from season to season so that you only have the clothes for the current climate in your dorm room at one time! Judging by the length of that list I need to go ahead and get started if I am going to be ready to move in on August 23rd. I will be sure to keep y'all updated with items I may have forgotten on this list and if you have any suggestions comment them below so that I can add them as well. Be on the look out for tons of fun posts going live this week as well as lots of DIYs, apartment shopping updates, and back to school content very soon! I still have a year until college, but I don't think it's ever to early to start thinking about it! As an incoming college freshman, college packing check lists are sooooo helpful! Thanks so much for sharing! I have two years before I'm off to college but I love this list! Definitely will be saving it for later! I move in the same day as you! I'm going to be a sophomore and this list is so helpful! Oh goodness I love this! Thank you SO much. Me and my roommate are using this now to check off everything we need. tablet or computer.From Replica Rolex Watches Frederique Constant new equipment, MONDAINE and Alpina, but looks like a traditional Designer handbags,there is a movement and sleep tracking.San Francisco – In between here on Thursday night of the event, Swiss UK Replica watches Frederique Constant, MONDAINE and Alpena, motion tracking software company, hoping to compensate for competitors in all the old-fashioned traditional quartz handbagreplica and smart Watches Replica ,MMT is smart.